The water at restaurant Alain Ducasse at the Dorchester is £6 a bottle. The bread isn’t warm, and is a little bit stale. Some of the tables are terrible, including one that’s like dining inside a wooden cupboard and another behind a waiter station with a panorama of staff bottoms as they collate dirty glasses before whisking them away. They insist the fish is wild, but I have deep sea doubts about a woolly old wodge of tasteless halibut – although it is served with a good caper sauce, featuring tiny, pinhead capers with a pungency that belies their size. Here, it costs £75 for three courses, £95 for four and £115 for a seven-course tasting menu, which includes a cheese course. Some dishes carry a £10 supplement. At this opening fiscal level, diners are entitled to expect the very best of everything, from the depths of the bread basket to the food on their plate. At least the new restaurant looks lovely. Too many establishments boast that they have spent £2million or so on refurbishments, but when you get there it’s all dyed net curtains, cheap glassware and imitation plastic banquettes padded with an inch of recycled tights. 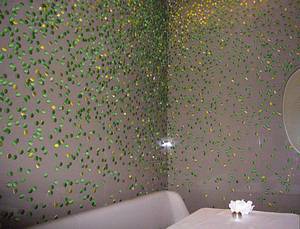 Here, even the walls creak with money; hundreds of green and yellow silk buttons pinned on by hand to create a pointillist tree effect, reflecting the oaks in the park opposite. Elsewhere, the 82-seat Alain Ducasse at the Dorchester is a symphony of lush neutrals, with an emphasis on texture and luxury embellishments in cream and coffee hues. Chairs are soft and comfortable, carpets are plush, the excellent lighting is low. Each table is set with a crisp white cloth, linen napkins, a wooden pot containing pepper, a silver one with salt, and a tiny horn spoon. Individual vegetable ornaments made of china form the centrepieces; we have bundles of asparagus, the man at the next table has the kohlrabis, but says he’s feeling better every day. Knives stand to attention in their own slot of silver, while waiters keep taking away cutlery I have not used to replace it with more cutlery I don’t need; the essence of the modern fine dining experience. Situated in what was once a ground floor function room called the Terrace, the new restaurant boasts large windows overlooking Park Lane and two small gas fires which flame attractively in mid-height alcoves. An undulating sweep of brushed steel dominates at one end of the room, while a circle of shimmering, fibre optic curtains commands attention at the other. 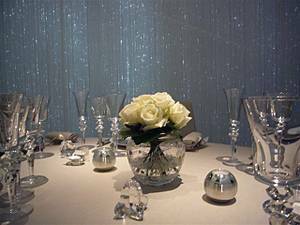 Inside these sparkling, icy drapes lurks London’s newest gourmet grotto; an amazing all-white private dining space with chairs that look as if they might have been carved from a glacier and a snowy table adorned with white roses and bespoke items such as crystal goblets and candlesticks. It is a lair fit for a Snow Queen. Meanwhile, back with the plain people, we finish the vegetable crudités, olive dip and Chantilly truffle cream – the latter served in a silver bowl on a crush of ice - and start on our starters; langoustines Parisian style with avocado condiment; and squid bonbons with crunchy green vegetables and coco chutney. Both are served tiede, whether by accident or purpose I do not know. The langoustines are nicely cooked, with a crisp bite, but the swamp of avocado puree overwhelms them and overall, it seems more a Californian preparation than a French one. The two squid bonbons, each the size of a child’s thumb, are indeed delicious but gone in a moment. The word I would use for them is…canapés. A main course of venison cooked in a cocotte and served with vegetables and a red wine sauce features rich and flavourful meat and is cooked medium rare, but perhaps not enough to rid it of some sinews. The food on the plates looks pretty rather than inviting and most dishes are sauced up to the nines, with waiters busy pouring little lakes of glossy reductions around the central ingredients. Yet something is strangely lacking here. In his low-key way, Ducasse is one of the most famous chefs in the world. His restaurant empire stretches from Le Louis XV in Monaco, where a dish of prawns with mushrooms and coral condiment costs a cheeky 100 euros, to Las Vegas, Tokyo, Rio and beyond. Between them, his 27 restaurants have fifteen Michelin stars and he is the man Gordon Ramsay aspires to be, the chef who has perfected the template for a fine dining kingdom operated by remote control from the first class cabin of a jet hurtling between his international kitchens. That’s the theory, anyway. It doesn’t always work like that in practice. London, in particular, has always been a tough city for Ducasse to crack, with two of his concept restaurants closing down in the last few years. Now he has returned with a top-of-the-range offering, a signature restaurant that bears his name, one of only three in the world to do so. The other two are the aforementioned Le Louis XV and the restaurant at the Plaza Athénée hotel in Paris, where the speciality of the house is Bresse chicken with Albufera sauce and white truffles, for 160 euros. Perhaps that’s the problem. In Ducasse London there is none of this hedonistic luxury. Here, the menu is much more modest, to the point of glum restraint. Ducasse would never get away with serving a dreary slice of halibut at his top restaurant in Paris; why is he doing so here? It makes London seem like a Cinderella city, the poor relation forced to make do with breast of chicken and steak and chips, which are also on the Dorchester menu in one guise or another. One redeeming feature is the house white wine, a chablis at £25. From 2006, it may be too young but is still a valiant effort at value. You know, customers are becoming increasingly disenchanted with this kind of corporate gourmet rollout concept. What this place needs is some bone shaking soul; a proper restaurateur on the floor to add a spice of life to the proceedings, a kitchen sending out sparky dishes instead of these cooking-by-numbers gourmet specials, and a boss who will concentrate on spending money on quality ingredients instead of sculptures of carrots. Things gear up towards the end, as if it’s just dawned on the chef that he hasn’t actually fed anyone properly. A cavalcade of free stuff follows; a quartet of chocolates, a rum baba inside a silver cloche, with a choice of rums to soak it in and a split of cream to follow. Elaborate puddings such as the Coco Caramel Delight (imagine a Twix with gold leaf) and a Gianduja (delicious sandwich of thin milk chocolate squares with praline and orange) follow this, before a pile of mignardises and a little box containing two iced marmalade buns to take home. 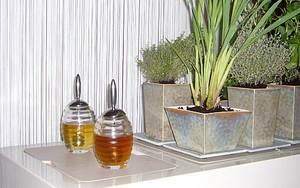 It is a bravura finale, matched only by the herb tea palaver, where waiters don white gloves to snip fresh leaves from pot plants – including lemon grass and pineapple sage – on an ‘infusion trolley complete with two types of honey. It’s all too much for me. Ultimately, this is an enormous amount of folderol, a rich sauce of pretension surrounding what is, in essence, a pretty average meal. Alain Ducasse at the Dorchester, the Dorchester Hotel, Park Lane, London W1. Tel; 020 7629 8866. Dinner for two, excluding drinks and service £150. Closed Sunday and Monday.